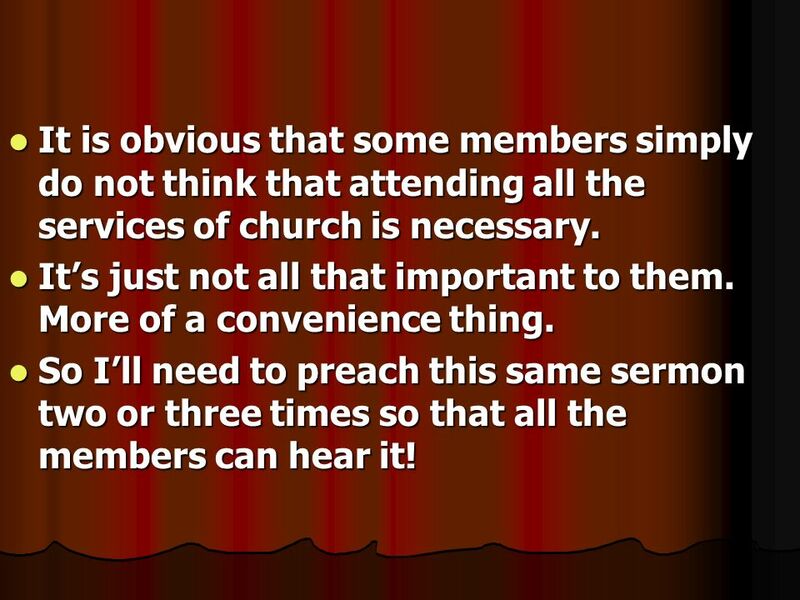 3 It is obvious that some members simply do not think that attending all the services of church is necessary. It’s just not all that important to them. More of a convenience thing. 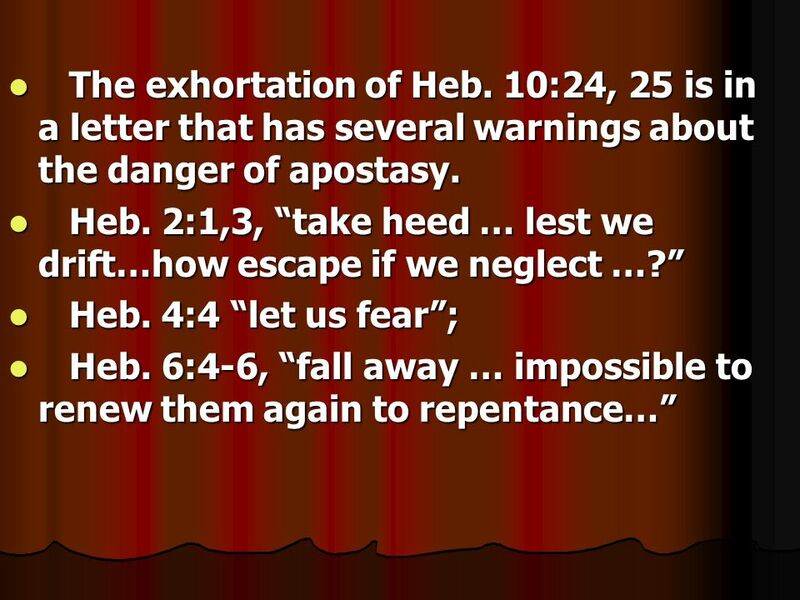 So I’ll need to preach this same sermon two or three times so that all the members can hear it! 6 II. Worshipping God is the principal purpose of the church. Eph. 3:21, “to Him be the glory in the church by Christ Jesus to all generations, forever and ever. 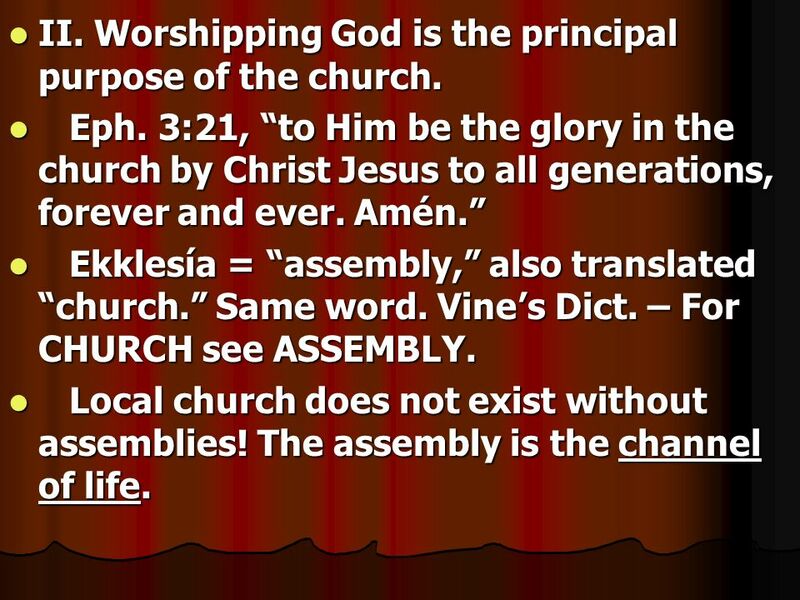 Amén.” Ekklesía = “assembly,” also translated “church.” Same word. Vine’s Dict. – For CHURCH see ASSEMBLY. Local church does not exist without assemblies! The assembly is the channel of life. 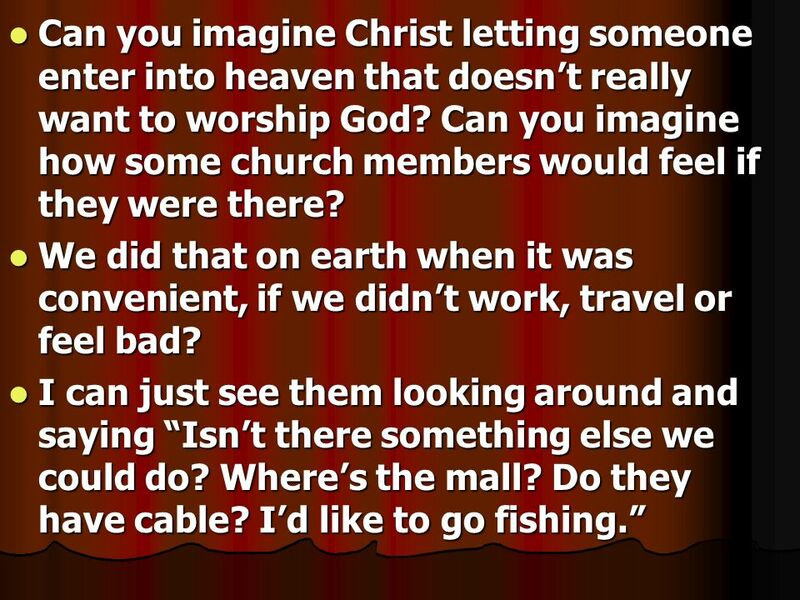 7 If we don’t enjoy worshipping God now, why talk about going to Heaven? 8 III. 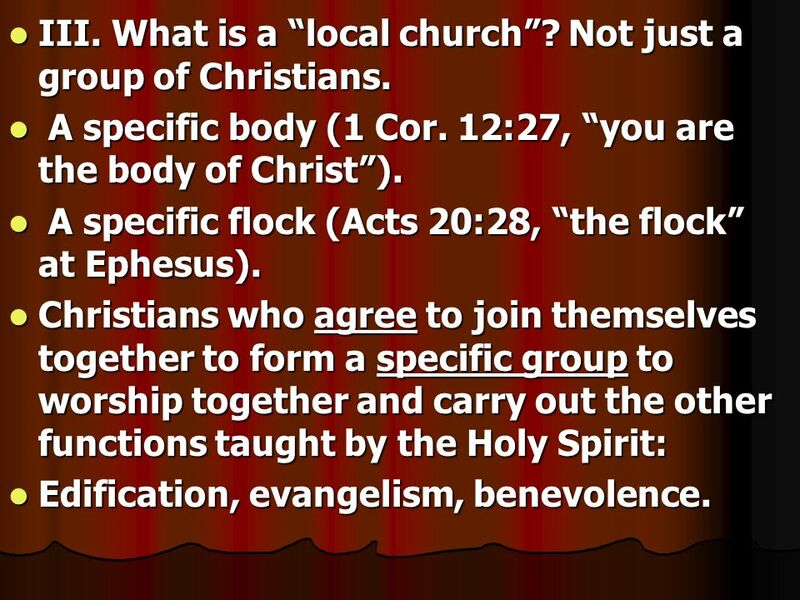 What is a “local church”? Not just a group of Christians. A specific body (1 Cor. 12:27, “you are the body of Christ”). 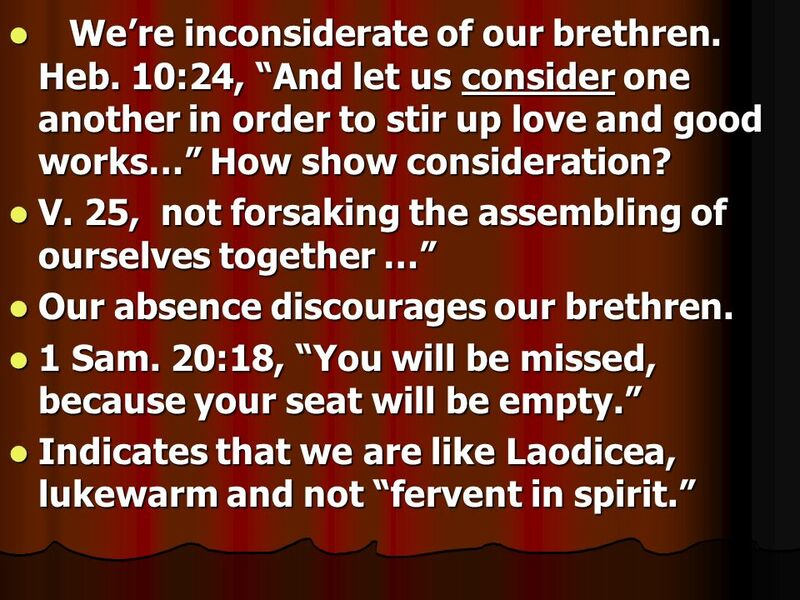 A specific flock (Acts 20:28, “the flock” at Ephesus). 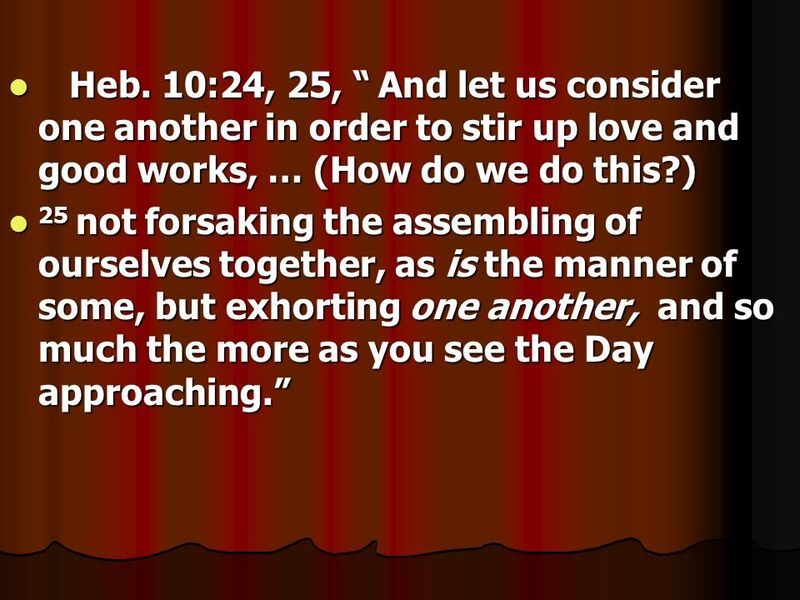 Christians who agree to join themselves together to form a specific group to worship together and carry out the other functions taught by the Holy Spirit: Edification, evangelism, benevolence. 9 This means that every member accepts the order of worship and Bible classes that has been established (1 Cor. 14:40) and should make arrangements to attend all the services and classes faithfully. Every member is committed to be responsible as a functioning member. Great blessing with responsibilities. If someone says, “Well, I didn’t agree to attend all the services.” ARE WE MEMBERS OR JUST VISITORS? The church should grow spiritually and numerically. 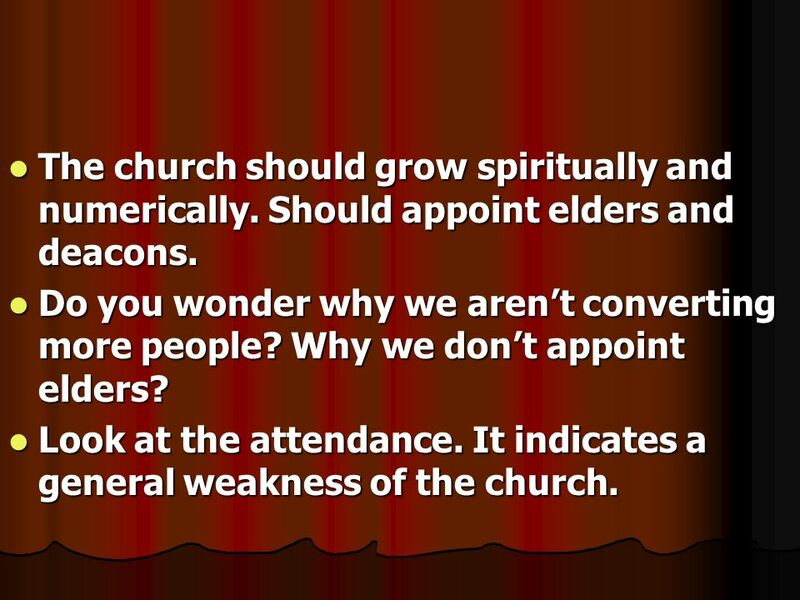 Should appoint elders and deacons. Do you wonder why we aren’t converting more people? Why we don’t appoint elders? Look at the attendance. It indicates a general weakness of the church. 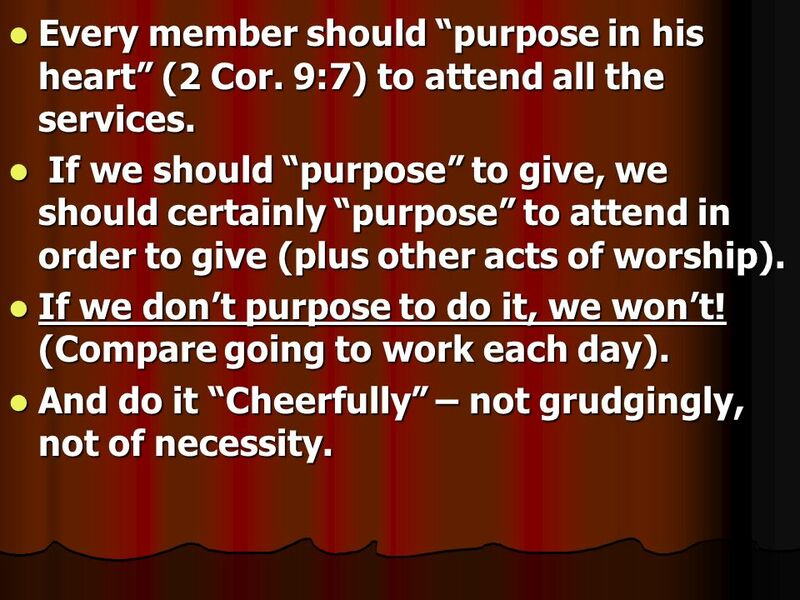 Every member should “purpose in his heart” (2 Cor. 9:7) to attend all the services. 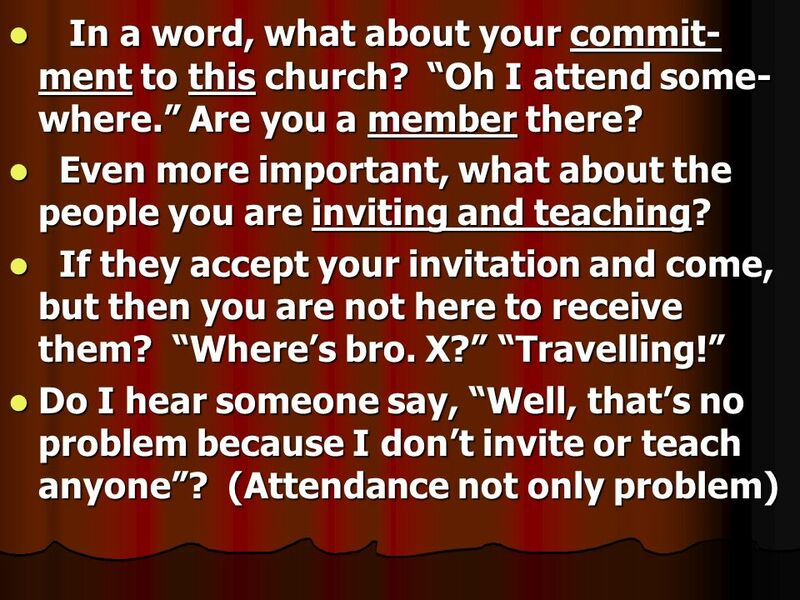 If we should “purpose” to give, we should certainly “purpose” to attend in order to give (plus other acts of worship). If we don’t purpose to do it, we won’t! (Compare going to work each day). And do it “Cheerfully” – not grudgingly, not of necessity. 12 IV. 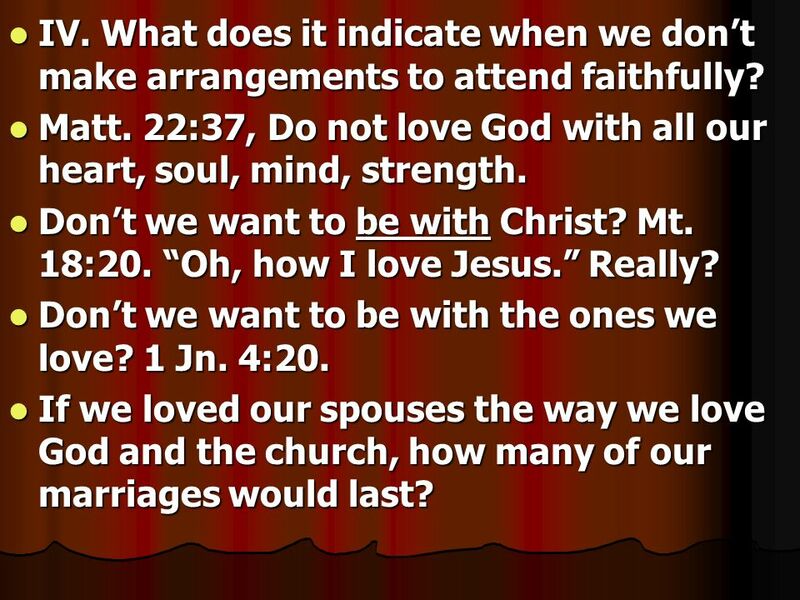 What does it indicate when we don’t make arrangements to attend faithfully? Matt. 22:37, Do not love God with all our heart, soul, mind, strength. Don’t we want to be with Christ? Mt. 18:20. “Oh, how I love Jesus.” Really? Don’t we want to be with the ones we love? 1 Jn. 4:20. If we loved our spouses the way we love God and the church, how many of our marriages would last? 13 Indicates that we are not really interested in edification, our own or that of our brethren. 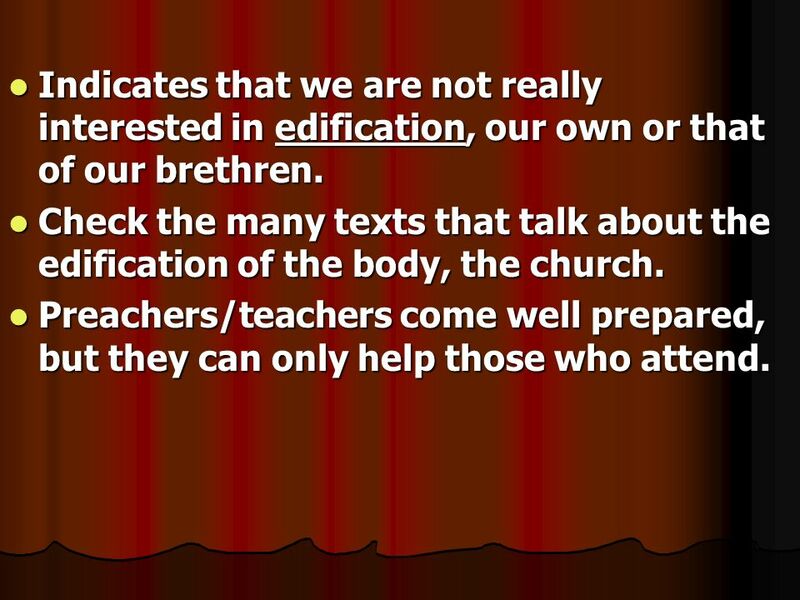 Check the many texts that talk about the edification of the body, the church. Preachers/teachers come well prepared, but they can only help those who attend. 15 Indicates that we are ungrateful to God for all His blessings, ungrateful to Christ who suffered so much for us. Indicates that we’re like Israelites who offered to God the “blind, the lame and the sick” (Mal. 1:8). We give Him “leftovers.” We set a bad example for our own children (Eph. 6:4), for new members, for weak members, for visitors. We are a stumbling block to others. Matt. 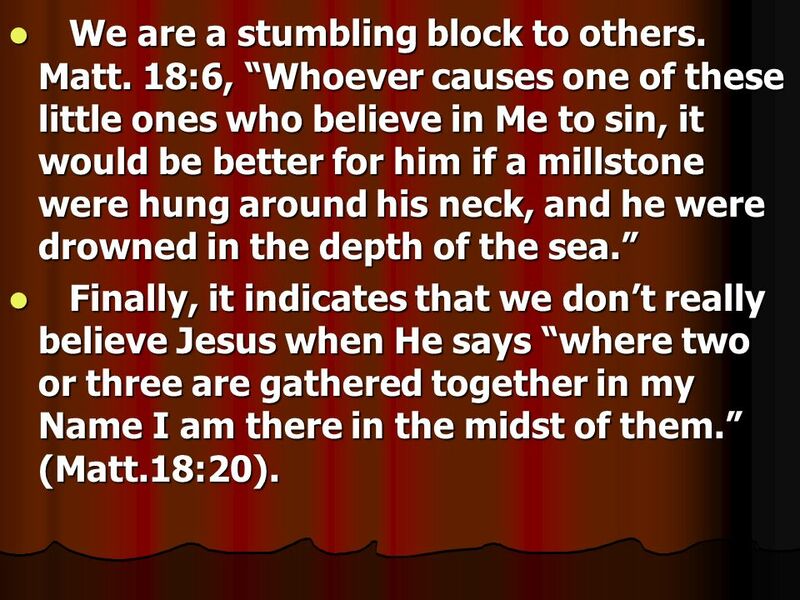 18:6, “Whoever causes one of these little ones who believe in Me to sin, it would be better for him if a millstone were hung around his neck, and he were drowned in the depth of the sea.” Finally, it indicates that we don’t really believe Jesus when He says “where two or three are gathered together in my Name I am there in the midst of them.” (Matt.18:20). 17 VI. What exactly does Matt. 6:33 mean? 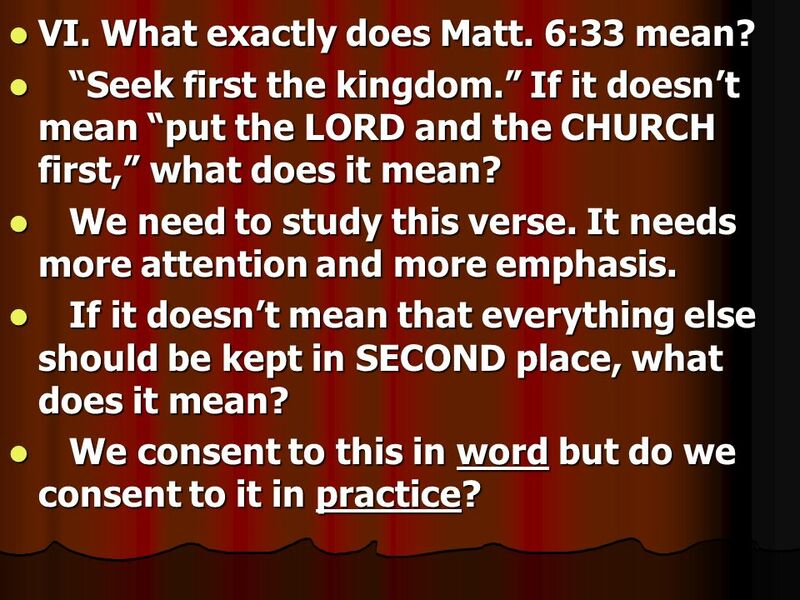 “Seek first the kingdom.” If it doesn’t mean “put the LORD and the CHURCH first,” what does it mean? We need to study this verse. It needs more attention and more emphasis. If it doesn’t mean that everything else should be kept in SECOND place, what does it mean? We consent to this in word but do we consent to it in practice? 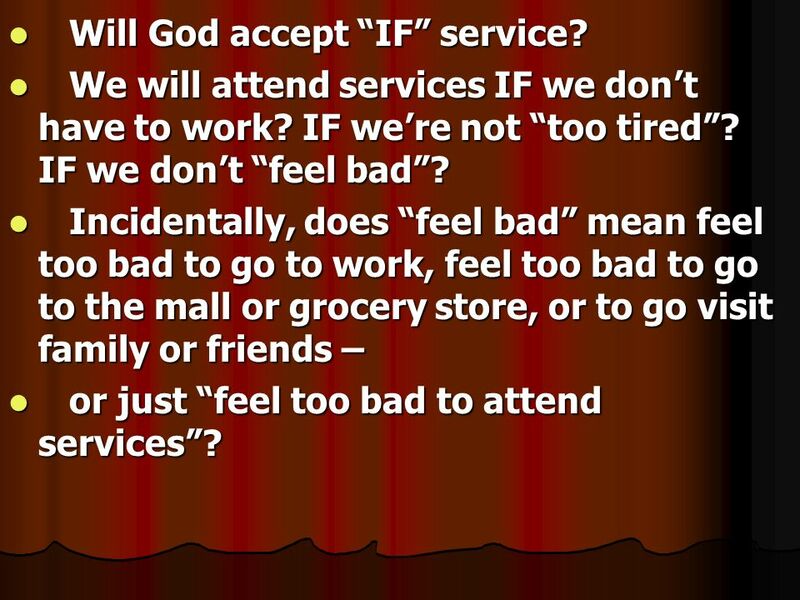 18 Will God accept “IF” service? We will attend services IF we don’t have to work? IF we’re not “too tired”? IF we don’t “feel bad”? Incidentally, does “feel bad” mean feel too bad to go to work, feel too bad to go to the mall or grocery store, or to go visit family or friends – or just “feel too bad to attend services”? 19 And, of course, a big one is “IF we don’t “travel”? 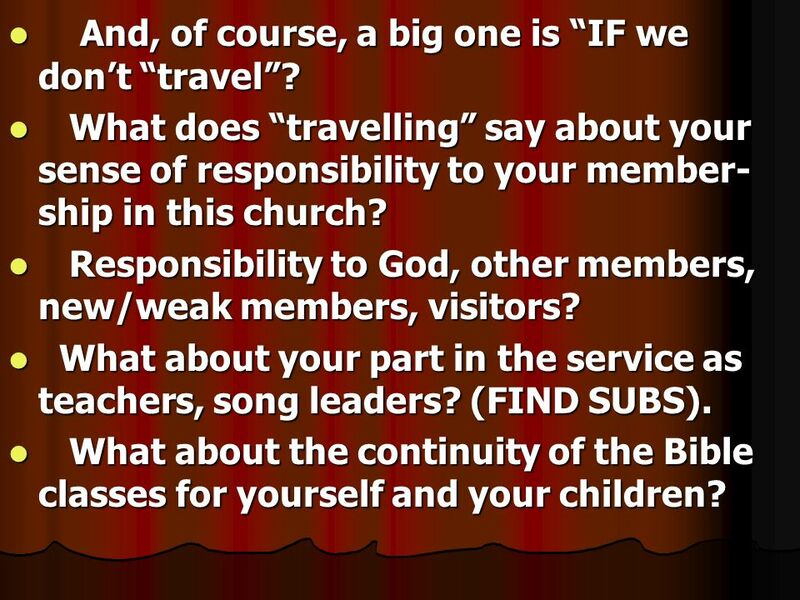 What does “travelling” say about your sense of responsibility to your member-ship in this church? Responsibility to God, other members, new/weak members, visitors? What about your part in the service as teachers, song leaders? (FIND SUBS). What about the continuity of the Bible classes for yourself and your children? 21 VII. Each week God gives us 168 hours. We can’t worship Him for two hours (Sun.) 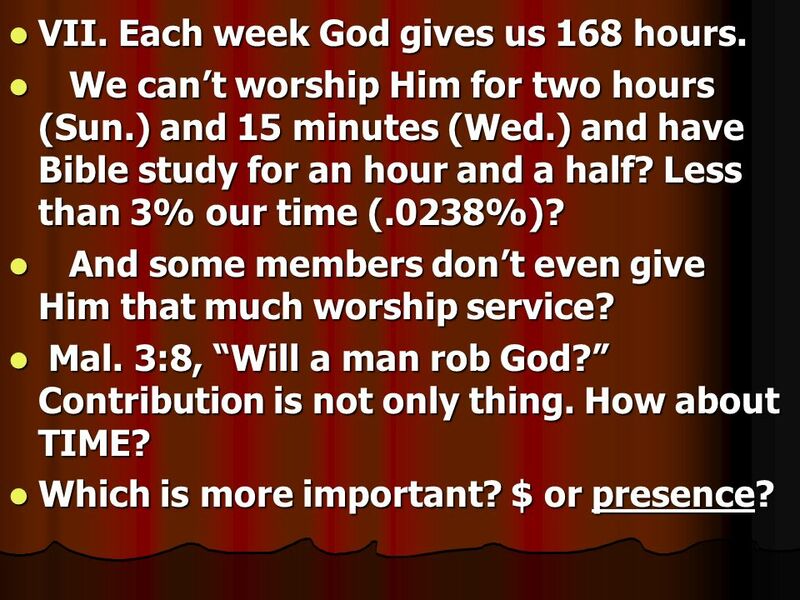 and 15 minutes (Wed.) and have Bible study for an hour and a half? Less than 3% our time (.0238%)? And some members don’t even give Him that much worship service? Mal. 3:8, “Will a man rob God?” Contribution is not only thing. How about TIME? Which is more important? $ or presence? 22 Lk. 14:18, 19, Can’t attend, bought a piece of land, five yoke of oxen, and the very best excuse: I’ve married a wife and can’t come. Just like the slaves of the first century. Today employers are virtual slave owners. Might as well put their brand on their employees, they OWN them body, soul! “Yes, but there are certain things we have to do on Sunday and Wed. p.m.” Absolutely, but who decides this? 1 Cor. 6:19; Rom. 6:18, slaves do not have a will of their own! 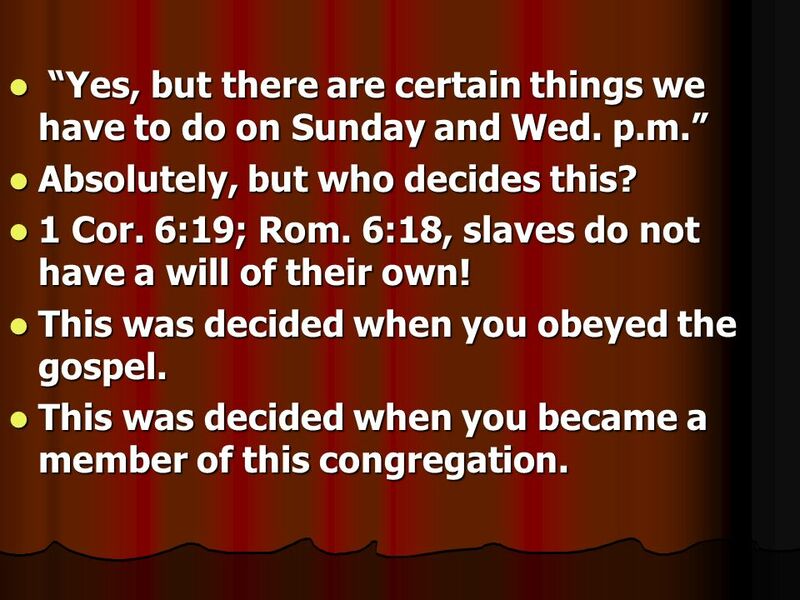 This was decided when you obeyed the gospel. This was decided when you became a member of this congregation. “Not available!” Sun , 5:30-6:30, Wed. 7-8… have “prior commitment” with God! … He comes first 24/7. Afraid to displease men? Heb. 10:24-31. What about personnel of hospitals, doctors, nurses, police, firemen, industrial plants, malls, etc.? Can they be saved? 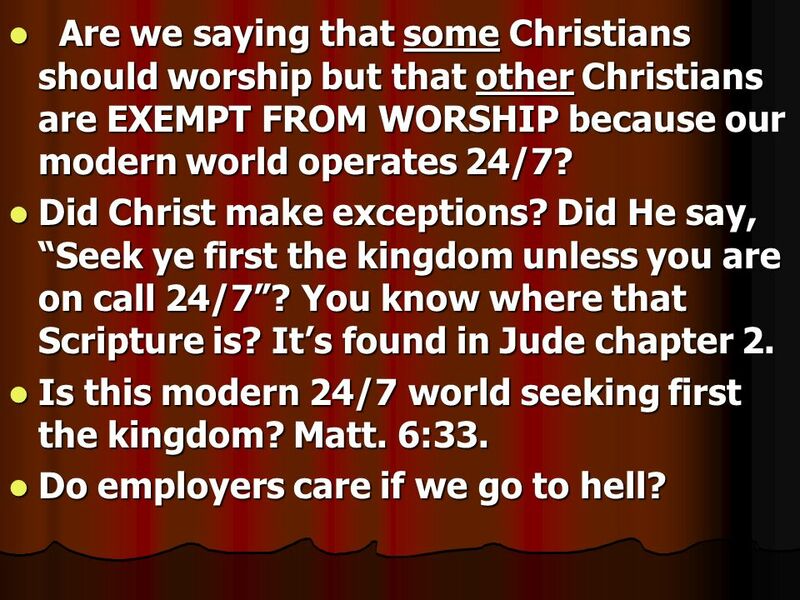 25 Are we saying that some Christians should worship but that other Christians are EXEMPT FROM WORSHIP because our modern world operates 24/7? Did Christ make exceptions? 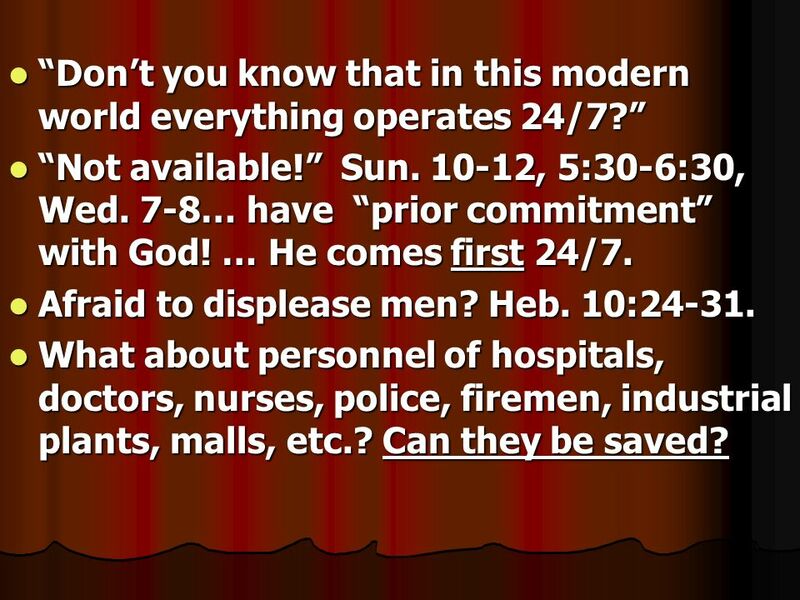 Did He say, “Seek ye first the kingdom unless you are on call 24/7”? You know where that Scripture is? It’s found in Jude chapter 2. Is this modern 24/7 world seeking first the kingdom? Matt. 6:33. Do employers care if we go to hell? What about Sunday worship? Is it just so we can partake of Lord’s Supper? As if it were a “sacramant”? Is that what it really boils down to? 30 minute service, Sun. 7:00 – 7:30? 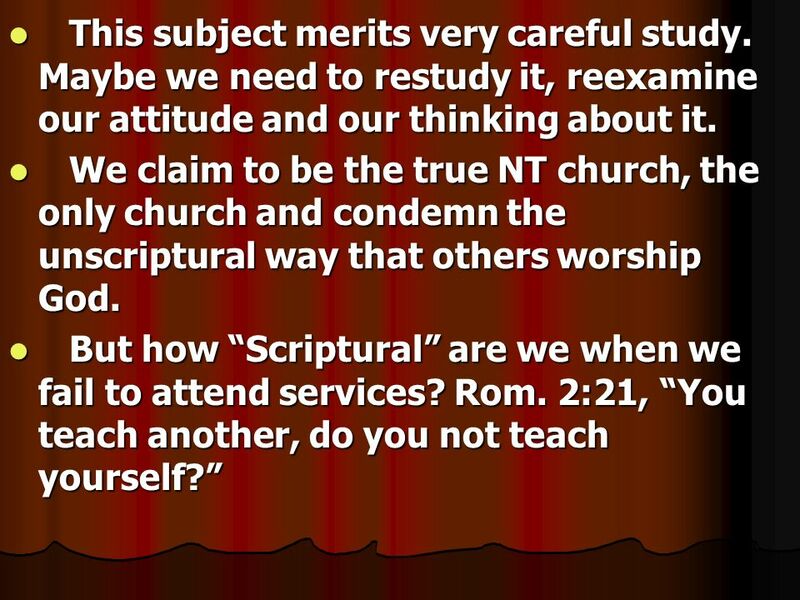 Real short sermon, no Bible classes? Would it be Scriptural? Acceptable? If not, why not? Use Scripture. 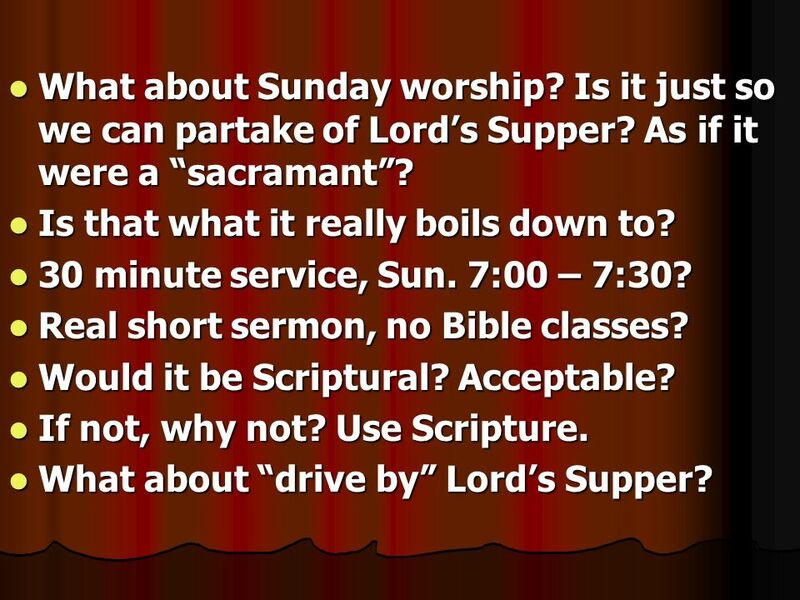 What about “drive by” Lord’s Supper? 27 “Just so we come to one service”? 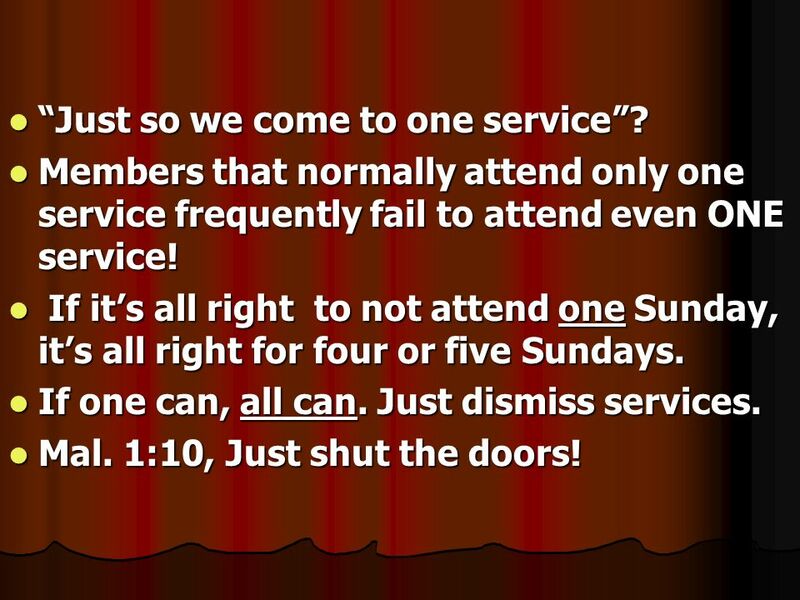 Members that normally attend only one service frequently fail to attend even ONE service! If it’s all right to not attend one Sunday, it’s all right for four or five Sundays. If one can, all can. Just dismiss services. Mal. 1:10, Just shut the doors! We have to give God “left-overs”? We have to put God 2nd? “on hold”? 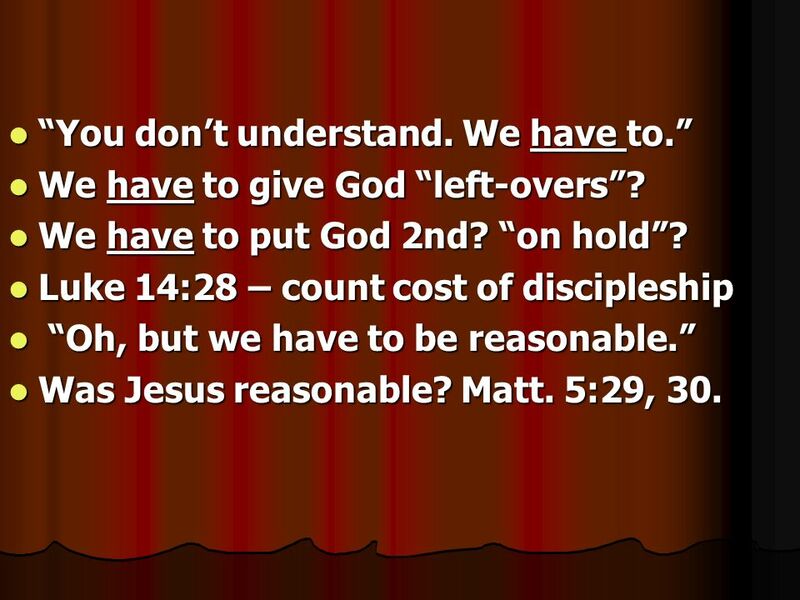 Luke 14:28 – count cost of discipleship “Oh, but we have to be reasonable.” Was Jesus reasonable? Matt. 5:29, 30. 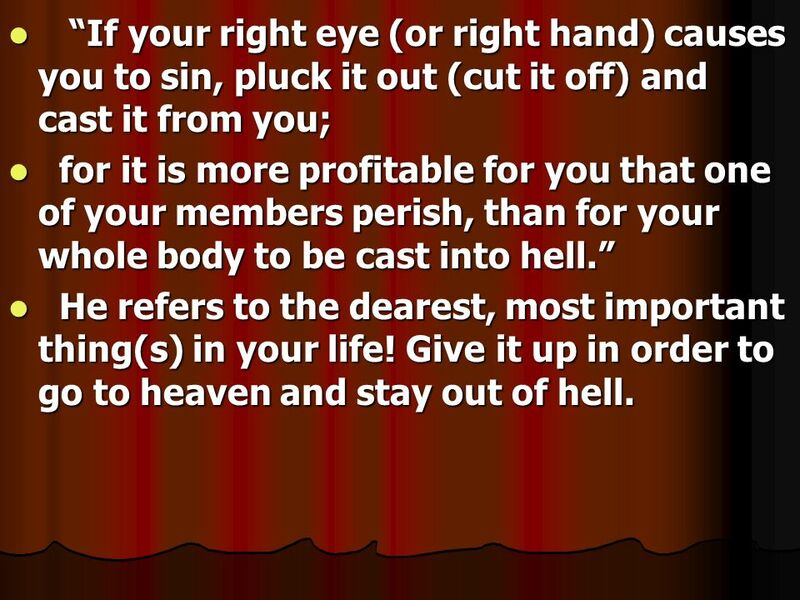 29 “If your right eye (or right hand) causes you to sin, pluck it out (cut it off) and cast it from you; for it is more profitable for you that one of your members perish, than for your whole body to be cast into hell.” He refers to the dearest, most important thing(s) in your life! Give it up in order to go to heaven and stay out of hell. 30 What would you tell a couple who admittedly are living in adultery and maybe even have children? 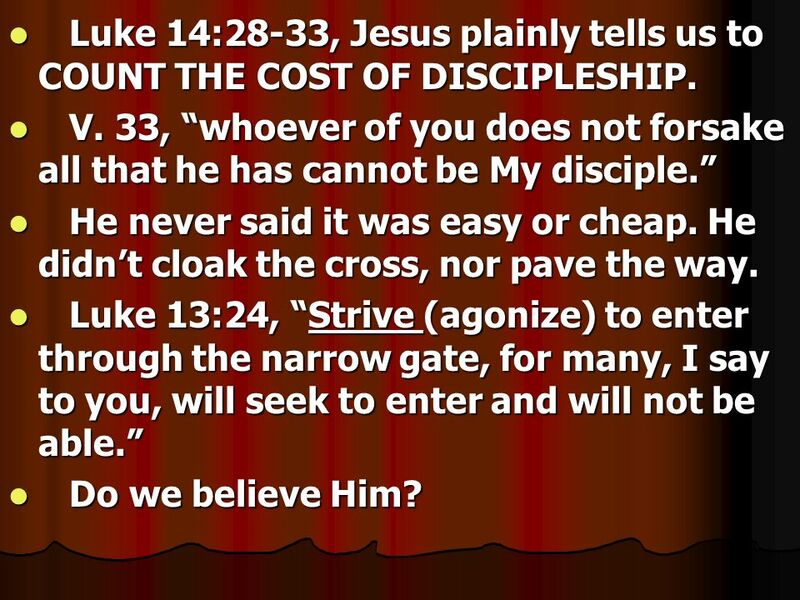 31 Luke 14:28-33, Jesus plainly tells us to COUNT THE COST OF DISCIPLESHIP. V. 33, “whoever of you does not forsake all that he has cannot be My disciple.” He never said it was easy or cheap. He didn’t cloak the cross, nor pave the way. Luke 13:24, “Strive (agonize) to enter through the narrow gate, for many, I say to you, will seek to enter and will not be able.” Do we believe Him? 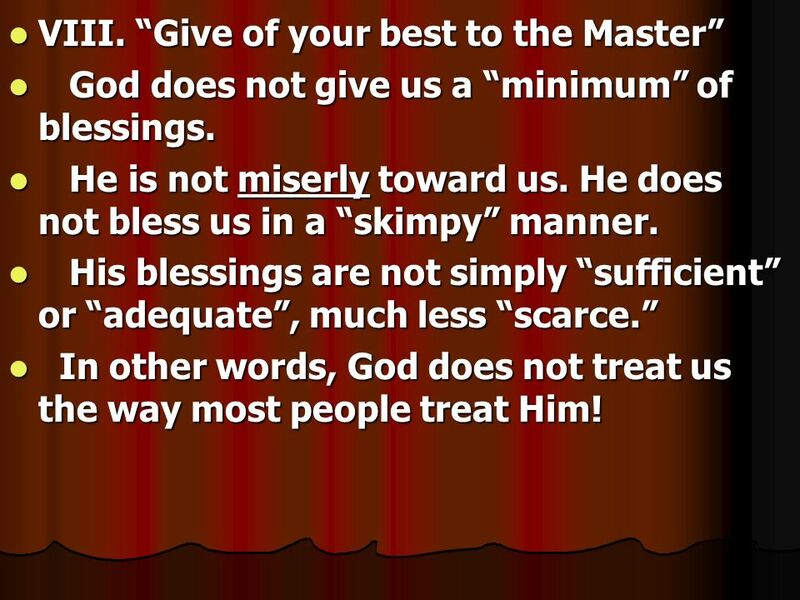 God does not give us a “minimum” of blessings. He is not miserly toward us. He does not bless us in a “skimpy” manner. His blessings are not simply “sufficient” or “adequate”, much less “scarce.” In other words, God does not treat us the way most people treat Him! 33 But rather, God blesses us abundantly, generously, profusely. He “pours out” blessings on us. Will anyone deny this? 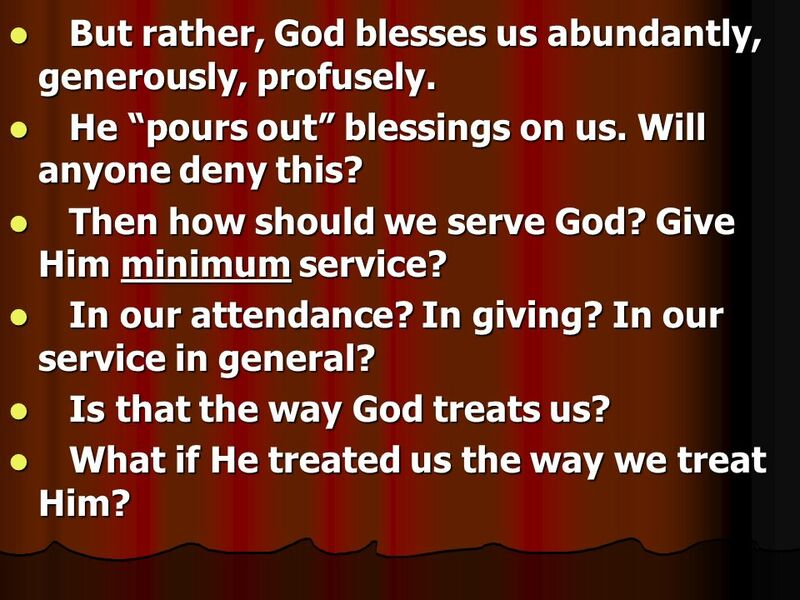 Then how should we serve God? Give Him minimum service? In our attendance? In giving? In our service in general? Is that the way God treats us? What if He treated us the way we treat Him? 34 CONCLUSION. 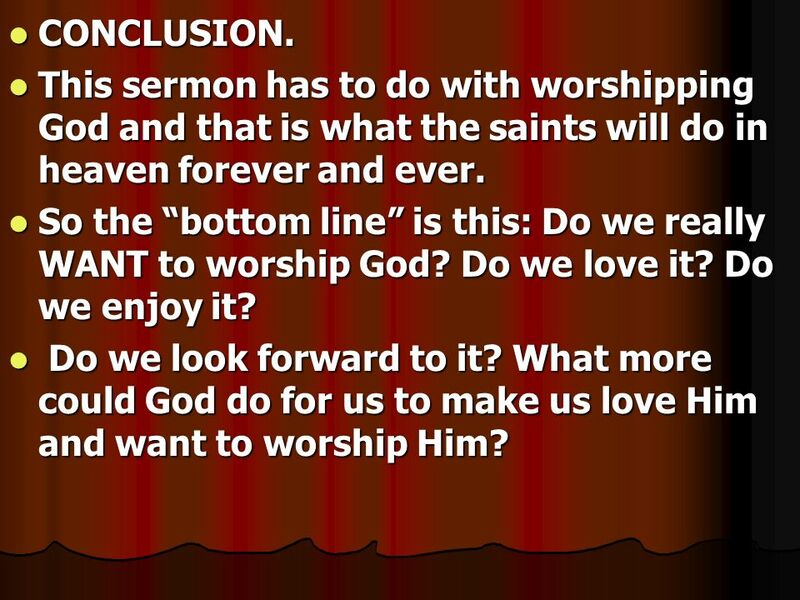 This sermon has to do with worshipping God and that is what the saints will do in heaven forever and ever. 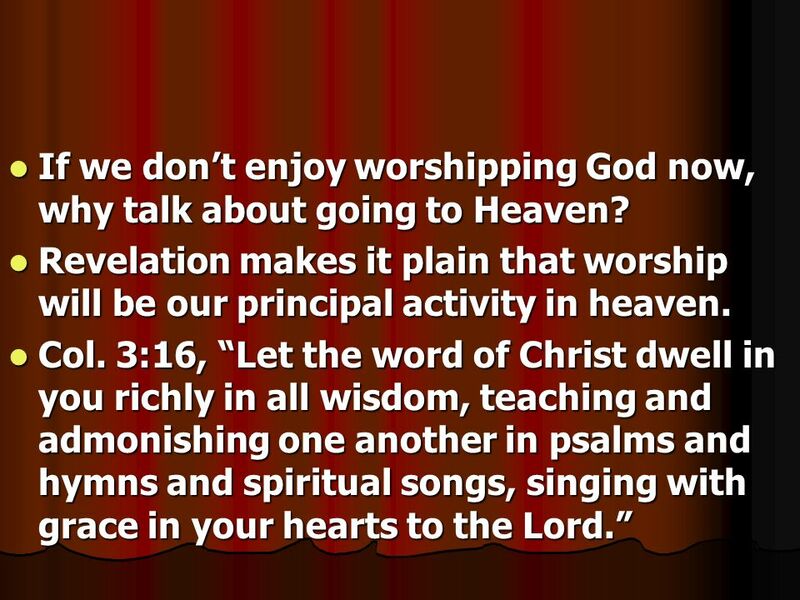 So the “bottom line” is this: Do we really WANT to worship God? Do we love it? Do we enjoy it? Do we look forward to it? What more could God do for us to make us love Him and want to worship Him? 36 Yes, it just so happens that there is a place you can go and not have to worship God. No assembly. No singing. No preaching. No Lord’s Supper. No Contribution. No invitation song. 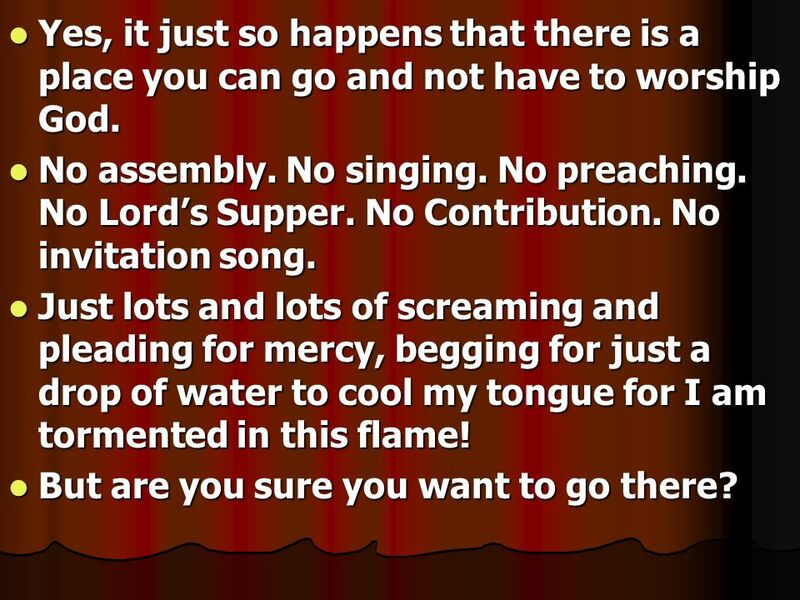 Just lots and lots of screaming and pleading for mercy, begging for just a drop of water to cool my tongue for I am tormented in this flame! But are you sure you want to go there? 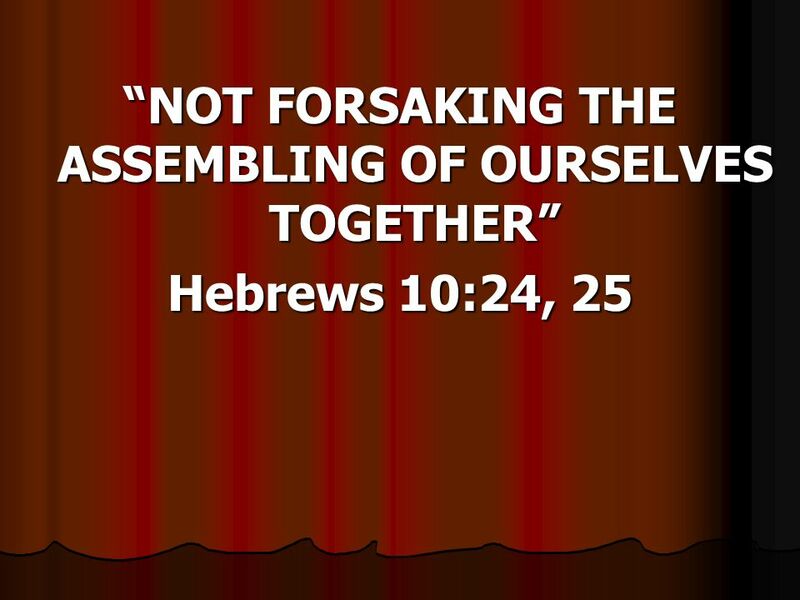 Download ppt "“NOT FORSAKING THE ASSEMBLING OF OURSELVES TOGETHER”"
Responding to the Shepherd John 10. Who or what are you listening to? Summertime Sins Part 2. Summertime Sins “not forsaking the assembling of ourselves together, as is the manner of some, but exhorting one another, and.